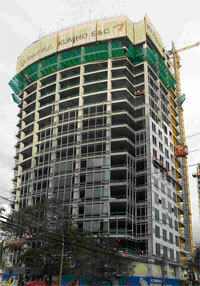 Kumho Asiana Plaza is currently the biggest commercial project in downtown of HCMC. This grade A project comprises of 3 towers - Intercontinental Asiana Saigon Service Apartment; Five Star Intercontinental Asiana Saigon Hotel; and an office building. Asiatic Vietnam was awarded a $0.8 million contract to supply ventilators from Greenheck (USA); and Marley cooling towers for this project. Asiatic is proud to be part of this most prominent project by one of the biggest Korean investor, Kumho, in HCMC.